This quest starts from Barkskin Tome which drops from a Petrified Ancient (visible only after you have Lumber Mill Level 2). It requires that you kill 4 ancients, each in a different zone. They will spawn only when you are harvesting medium-sized Timber (not Small Timber). You'll be placed immediately into combat with them, so be ready. If you run out and drop combat, they will disappear. After quite some time searching for the Petrified Ancient to start this quest, I found out that after some Timber gathering my Horde Timber Lord started talking about the tree being scared, petrified. After that he appeared @40.6 30.0 Nagrand. Since you need the Lumber Mill, Level 3 for the Lumber Mill - Level 3. This is for Upgrading the Mill, which you need to complete. Kuruk the Ancient - Kuruk - Shadowmoon Valley - Socrethar's Rise @ Contains Timber and Large Timber in the Area. Hanuk the Ancient - Roots - Spires of Arak - Nest of Ravenspeakers (Middle of the zone). Autuk the Ancient - Trunk - Nagrand - OSHU'GUN @ Nivek's Overlook (Southern parts). 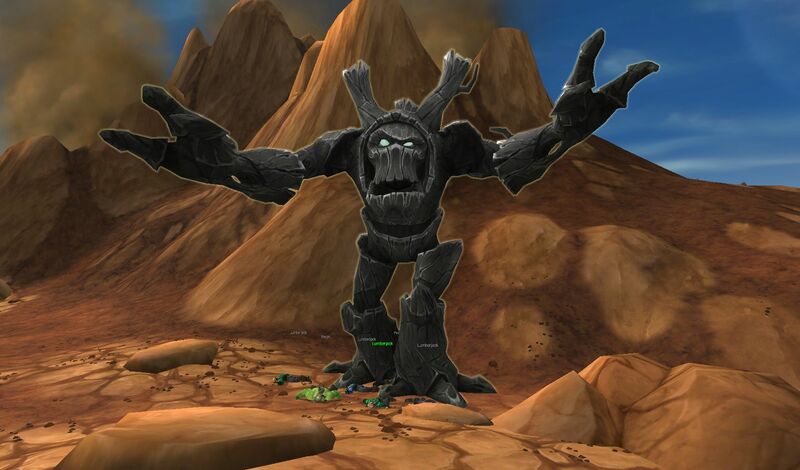 Gorgrond - Petrified Ancient <Dead Peons> - 41.61, 37.57 - Skysea point - (100 yard up the road). Gorgrond - Petrified Ancient <Dead Peons> - 43.65, 92.97 - Bastion Rise - (100 yard West from Flight Path) (world map). Gorgrond - Petrified Ancient <Dead Peons> - 50.42, 42.47 - Gronn Canyon - (Close to the tiny Jungle). Gorgrond - Petrified Ancient <Dead Peons> - 57.61, 43.15 - Everbloom Wilds - (100 yard north of Flight Path). Gorgrond - Petrified Ancient <Dead Peons> - 62.05, 32.54 - Everbloom Wilds - West Above Water pools (rare: Venolasix). Spires of Arak - Petrified Ancient <Dead Peons> - 52.31, 52.23 - Nest of Ravenspeakers - Aproxamitly the area. By this time he will give you an quest and become your Lumbermill follower, Phylarch the Evergreen - Congratulations! When you get this quest it's because your lumber mill is already at level 2 or you cannot interact with the Petrified Ancient that will drop the Barkskin Tome you need to start this quest. Heart of Kuruk from Kuruk the Ancient is in Shadowmoon Valley. The best spot i have found is in Socrethar's Rise, level 100 area. Pay attention to the level 101 elite demons Sargerei Demonlord but the rest is easy. Twig of Loruk from Loruk the Ancient is in Gorgrond. Roots of Hanuk from Hanuk the Ancient is in Spires of Arak. Trunk of Autuk from Autuk the Ancient is in Nagrand. In order to get this quest you must locate a Petrified Ancient to chop down (warning, you will have to fight him) which in turn will give you Barkskin Tome. This quest item will then grant you this quest Legacy of the Ancients which is used to get Upgrading the Mill along with placing 75 work orders at your lumber mill to get your level 3 blueprint plans for Lumber Mill, Level 3. To get this quest you need to find and kill a petrified ancient. They can be found here: Petrified Ancient, you click him, like timber, then he will activate and you can kill him. From him you will loot a Barkskin Tome; This is what gives you the Legacy of the Ancient quest. I did a faction change while having the Legacy of the Ancients quest half-way done and now the quest has disappeared and I've been on the lookout for another Petrified Ancient. One key bit of information missing from all the comments here is how or who to turn this quest in. The final turn in, in the case of the alliance is at your garrison Saw Mill. There is Justin Timberlord waiting for the turn in. One key bit of information missing from all the comments here is how or who to turn this quest in. In the example of the alliance, the turn in is at the Lumber Mill in your garrison. There awaits Justin Timberlord to complete the quest. Collect the Heart of Kuruk, the Trunk of Autuk, the Twig of Loruk, and the Roots of Hanuk. Opening the ancient tome you see that it's not actually a tome at all, but a container. Inside are four empty slots. Upon closer inspection each slot has next to it a carving of what appears to be a unique Draenor ancient, some glyphs and a receptacle used to hold a piece of the pictured ancient. There also appear to be directions to where these ancients may be found: medium timber -- Shadowmoon, Gorgrond, the Spires of Arak and Nagrand. These are assassination instructions. From trees to kill trees. What have you got there, commander? So what you're saying is that this here book is actually a container to hold the remains of targets on a hit list? And the assassination was being perpetrated by another... tree? Now let's see what happens when we put all the pieces into place.